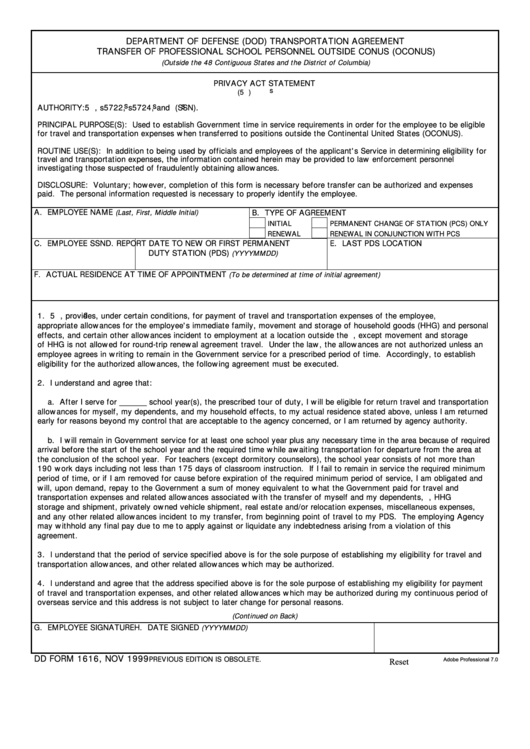 Download a blank fillable Dd Form 1616 - Department Of Defense (Dod) Transportation Agreement Transfer Of Professional School Personnel Outside Conus (Oconus) in PDF format just by clicking the "DOWNLOAD PDF" button. Complete Dd Form 1616 - Department Of Defense (Dod) Transportation Agreement Transfer Of Professional School Personnel Outside Conus (Oconus) with your personal data - all interactive fields are highlighted in places where you should type, access drop-down lists or select multiple-choice options. AUTHORITY: 5 U.S.C. s5701, s5722, s5724, and E.O. 9397 (SSN). for travel and transportation expenses when transferred to positions outside the Continental United States (OCONUS). investigating those suspected of fraudulently obtaining allowances. paid. The personal information requested is necessary to properly identify the employee. eligibility for the authorized allowances, the following agreement must be executed. early for reasons beyond my control that are acceptable to the agency concerned, or I am returned by agency authority. transportation allowances, and other related allowances which may be authorized. overseas service and this address is not subject to later change for personal reasons.